Discussion in 'JS Plugin Releases (RMMV)' started by Masked , Feb 23, 2016. This plugin makes your game a 3D labyrinth explorer, it's quite easy to use once everything is set up. I've been working on this for some time now, I really hope you enjoy it (and I swear I'll try my best to fix all the issues you report >.<). I really recommend you use the Demo as a base for creating your project, but if you can't do that, save the script to your game's "js/plugins" folder and follow the install instructions on the plugin help. More informations on the plugin help. - babylon.js team (https://github.com/BabylonJS/Babylon.js/graphs/contributors), for their aweasome library. plim, piksalh, Frogboy and 43 others like this. Interesting plugin! But i have black screen after start new game in your demo. I still can open menu but nothing else happens. I've been waiting for this. Really neat job. I'm having the black screen issue too, though. It resolves as soon as I enter the main menu and exit, but then all textures are tinted green. I played around with the plugin's setup a bit, nothing seems to help. EDIT: The computer I'm testing this from is rather on the low end, maybe this could have something to do with the video adapter? YES. I have been waiting for the port of this since MV's launch, awesome. Will do some tests and report. EDIT: This is an amazing start, easy to configure and get up and running. Haven't tried battling in it yet but I will do that later. 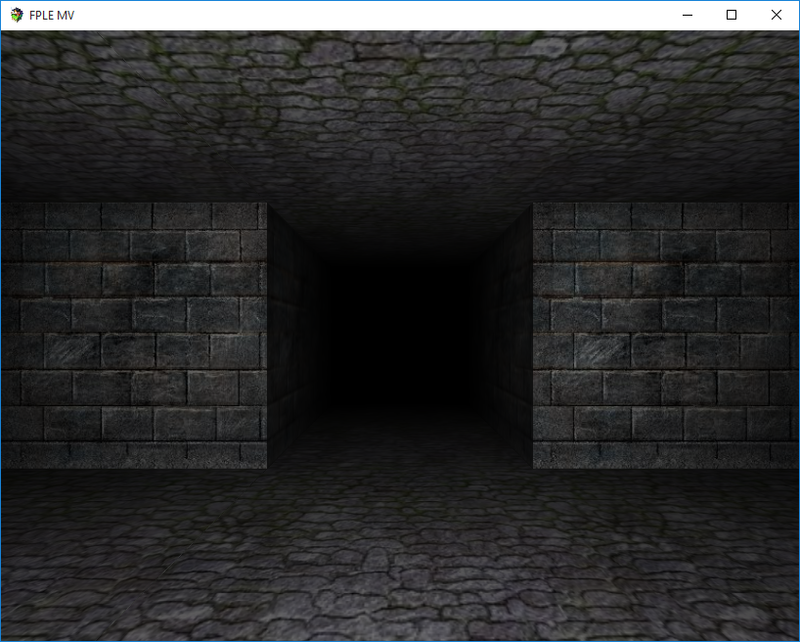 Excited to see configurable wall texture/lighting assignment through the plugin parameters if possible. Seems like an interesting idea, but unfortunately all I get is a black screen. I'm assuming this recreates the old wizardry 1st person dungeon perspective. Hi, I saw this plugin in another forum and it's pretty nice! But it does have other kinds issues with some other plugins. I didn't get any minimap plugin (most from this forum) to work while this was turned on. Visible events on map (like scaled 2D sprites that always face you) would be nice. As it currently is, to make a treasure chest or a door, you need to make a texture with those things in it then make an invisible event for it. It isn't too practical. Looks neat - seems like something that would make me consider using RPG maker again. If so, try changing the material type on the plugin settings to "lambert" or "basic", it should help. I have the same problem here when I use MeshLambertMaterial, it happens because WebGL can't find some shaders and so it crashes and stops rendering the scene. I forgot to apply a fog when using it, I'll update the script soon. @Kaizer01 I forgot to override one method here, I'll fix it asap. I've not tested it with other plugins, everything should work unless they use Spriteset_Map since I removed it from Scene_Map. I already have all the event stuff ready here, they appear on screen and everything, but animations and directions don't work. Works fine for me in browser, no black screen, your demo works in browser too. try changing the material type on the plugin settings to "lambert" or "basic", it should help. I have the same problem here when I use MeshLambertMaterial, it happens because WebGL can't find some shaders and so it crashes and stops rendering the scene. phong\lambert - black screen in play test, but "basic" works fine only without fog. I can't even open the .rar file for the demo lol. It gives me an error. And yes I tried to re-download it again. Same here. It's refusing to open. I re downloaded it 6 times, it keeps doing the same thing... i click to open it and it opens the folder it's in.. but not the rare it's self. When i use winrar, it says the file is damaged. Phong initially shows a black screen. After entering and exiting the menu, everything shows, but is tinted green. Lambert shows a black screen. Entering/exiting the menu doesn't affect it. Basic works just fine (no effects though). Update: I decided to move to BabylonJS since it seems to be more widely usable. - Babylon provides some optimization options that really improve game performance. - Using parallaxes as sky isn't possible anymore, I'll have to implement it later. Halrawk and Krimer like this. The new demo is working for me, the maze looks great, it's a really impressive accomplishment. I have a question what happened to the status menu, only option and exit are available (item, status, and skills are missing)? That's because they are disabled in the demo. - Some wall textures are rotated randomly in some walls (example: the wall bricks are in a vertical orientation instead of horizontal). Is there a certain way to set up the walls or is this some kind of bug? EDIT: Probably a bug, since I saw the texture of a pair of walls rotate when I stepped back while still looking at them. - This might sound stupid, but to make the mazes run smoother should I put the optimization level on high or none? While it runs "pretty well" as I said, it still takes a little more time to load and process a few things than the previous version. I'm worried if it will run well on less powerful machines. You can active them on Database > System (Menu Commands). @Kaizer01 That's good, apparently the BabylonJS migration worth it. Higher optimization means higher performance, but it will also degrade your game's graphics (the texture rotation problem, for instance, which should happen only on high optimization level). It would be nice if the player could choose the level of optimization he wants so you don't have to worry about less powerful machines, I'll implement it along with some features people recommended me soon. no black screen in new demo for me too. Is it possible to have normal maps (i mean in 2d with normal tile and stuff) and 3d labyrinth maps? Because as i can see for now its only 3d labyrinth maps available. If not, can you add it in future? You mean like in Phantasy Star where it was first person in dungeons and caves but overhead in the towns and overworld? RachelTheSeeker, EnMod and Krimer like this.